The prodigal son has returned, and now it’s time for celebration. After years of production just north of the border in Ontario, the 2016 Chevy Camaro heralds a new era of American-made Camaros, newly-relocated to Chevy’s Lansing Grand River plant at Belle Isle in Detroit, Michigan. The move was first hinted at in 2012 by GM, which expressed a desire to return to American manufacturing in order to take advantage of lower capital investment and improved production efficiencies. Utilizing a $175 million investment to re-tool the Lansing plant this year, Chevy fully shifted Camaro production back stateside earlier this year. This is part of an April 30 pledge by GM to invest $5.4 billion in American factories over the next three years, of which nearly $2.8 billion has already been accounted for. It was here in May that Chevy first unveiled its designs for the 2016 Camaro, and so completion of the whole project from design to construction occurred on American soil. By the end of October, the first of the 2016 Camaros were rolling off the assembly line and being shipped out to consumers nationwide. In order to accommodate the new production, the Lansing plant needed to undergo significant upgrades to its assembly line. These include three new paint systems (for Camaro-specific colors: Summit White, Bright Yellow, and Red Hot), as well as the installation of two robotic framers, which provide a more precise drive experience through more advanced dimensional control. One major reason behind the shift was that the Camero was the only rear wheel drive model made at GM’s Oshawa plant in Ontario while the Lansing plant was already building the RWD Cadillac CTS and ATS models. 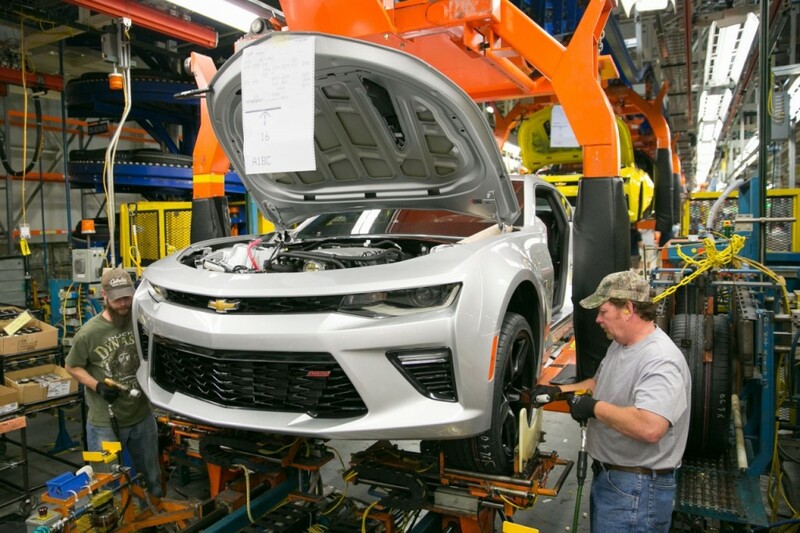 By consolidating these into one plant, Chevrolet is able to streamline its production process to improve efficiency. For the past five years, the fifth-generation Camaro has reigned supreme as America’s most popular sports vehicle. With a full design and performance upgrade for the sixth-generation, GM expects the new Camaro to improve on that success, relying on its numerous greatly improved technological and performance enhancements. This move represents a return of over 500 jobs to Michigan for Chevy, a move heralded by city officials in Detroit as well as the United Auto Workers union, whose members have been constructing vehicles in Lansing for over a century. For fifty years of its history, Chevrolet has been building and selling the Camaro to much public and industry acclaim. This is the first time the Camaro has been made in the U.S. since the 1990s; the entirety of the fifth-generation Camaro was constructed at the Oshawa plant in Ontario. The Oshawa plant is now bracing for a loss of about 1,000 jobs, even on the eve of the much-heralded Trans-Pacific Partnership trade agreement that many believe will boost automotive trade worldwide. Chevrolet, which was founded in Detroit in 1911, now sells over 4.8 million vehicles a year in 115 countries, making it one of the biggest automakers in the world. The 2016 Camaro features notable design changes, including a leaner, stiffer, more aerodynamic lightweight construction that reduces vehicle weight between 200 and 300 pounds from the fifth generation. This grants the 2016 Camaro better handling, a more nimble and lightweight response, and extensive aerodynamic precision. This sixth-generation Camaro is available in a hardbody coupe and a sleek convertible, with a top designed to mimic the look of the coupe and which can fold completely under the belt line under a hard folding tonneau, even if the vehicle is moving up to 30 miles per hour. This model will come in three trim levels, the standard LS, the improved RS, and the super-sporty SS. With each of these comes a distinctly Camaro powertrain set, including the supercharged 2.0-liter turbo four-cylinder, capable of a surprising 275 horsepower and an impressive 275 lb.-ft. of torque; the 3.6-liter V6, which combines 335 horsepower and 284lb.-ft. of torque with direct injection with variable valve timing paired with an eight-speed automatic transmission; and finally the powerful 6.2-liter LT1 V8 small block engine, capable of roaring out 455 horsepower and 455 lb.-ft. of torque and complete with functional and muscular vent fans on the front hood to keep the engine cool during high performance. With standard 18-inch wheels and Goodyear Eagle Sport all-season tires maintain an excellent grip on the road while keeping in with the stylish good looks of this new Camaro, while the RS package’s 20-inch wheels and Goodyear Eagle F1 Asymmetric all-season run-flat tires promise even better handling on the road at any time of the year. For all three trim levels, the driver may choose from three driving styles – Snow/Ice, Tour, Sport, and an additional Track on the SS model – that will activate different sounds from the dual-mode exhaust, so everyone can hear the awesome power of this impressive driving machine. With so much excitement generated around the new 2016 Chevy Camaro so far, it’s inspiring to see production of this highly-regarded line of sports cars move back to its birthplace in Detroit. For the citizens there and for everyone who appreciates American made cars, having one of the most successful and impressive models come home is a bit like the answer to a long-unanswered prayer. If you, like the rest of us, can’t wait to see for yourself how the 2016 Chevy Camaro will stack up to everybody’s expectations, then get in touch with DePaula Chevy today and see about checking out a new Camaro – With DePaula’s friendly service and instant cash offers for trade-ins, it’s unlikely that you’ll be disappointed.